Previous Mario Kart games have proven to be what Nintendo themselves call ‘evergreen sellers’ – games that keep on selling even years after being released. Obviously, then, it makes sense from a financial point of view for Nintendo to release a Mario Kart game early in a system’s life. Having Mario Kart 7 ready for the 3DS’s launch though perhaps made a little too much sense to Nintendo. Mario Kart 7, a name which seems even more rubbish after hearing Mario shout it out on the title screen, has a very similar look and feel to Mario Kart Wii. Motorbikes are no more but there are gliding and underwater sections. Gliding is far better than we expected. Weapons can still be used while airborne and you’re free to manoeuvre in every direction. Some tracks also have gusts of wind you can fly into to remain in the air for longer. 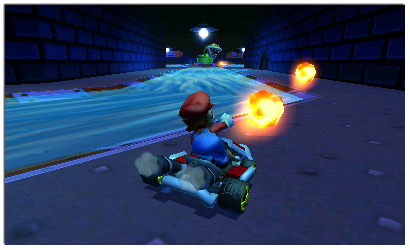 The underwater sections give you altered physics to contend with – the karts struggle to stay on the ground and a single projectile hit can send you way off track. Like Mario Kart Wii the tracks are a mixture of old and new. New track Piranha Plant Pipeway has been made to look like a level from the original NES Super Mario Bros, while Wario’s Galleon has lots of underwater sections to splash in and out of. A few tracks are set on long winding roads with checkpoints instead of lapping back round, including two set on Wuhu Island (last seen in Pilotwings Resort) and Rainbow Road. The shortcuts are brilliantly placed – we didn’t even notice some until we’d driven past them several times. The old tracks have been given a new lease of life with a few large ramps placed here and there to get you airborne. The tracks lifted from the GBA and SNES Mario Karts do look a little sterile though when compared to the likes of Coconut Mall and Maple Treeway from Mario Kart Wii. The weapon selection has had a significant shake up. Being given a mushroom when you’re already way out in front of the pack is now an uncommon occurrence. The two new weapons may give you a pang of nostalgia as they take the form of a fire flower and a super leaf which gives your character a Super Mario Bros 3-style tanooki tail. The fire flower gives you a handful of fireballs to lob which bounce around the track. Like the rest of the projectiles these can be thrown backwards. 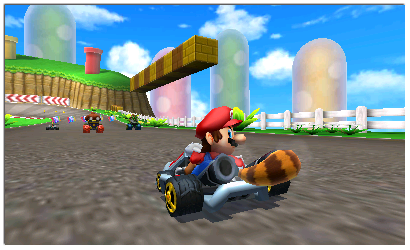 The tanooki tail meanwhile can be used to sideswipe rival racers and repel shells. Just to illustrate how good a job Nintendo has done with the notably sharp visuals, even with the 3D off, we still flinched the first time the screen got hit by blooper ink. At first the map on the bottom screen doesn’t seem particularly helpful but over time it soon becomes invaluable. Not only does it show you what weapons rivals are carrying but it also the weapons that are on the track, such as roaming green shells, and thus gives you a better chance of avoiding them. It’s also helpful for lining up projectiles to be thrown backwards and while playing the coin runners mini-game your rival’s location is shown. There are also coins on the track to collect. A maximum of ten can be held at once. These are used to unlock new kart parts which improve handling, weight and acceleration. Winning cups on the other hand unlocks new characters. Both provide good incentive to keep on playing. We all enjoy showing off freshly unlocked characters and karts online, don’t we? The menus for online play are very similar to Mario Kart Wii. You can play against random people or join in with people on your friend list who are already playing. You can also create a community where you can change rules and view a leaderboard. Like before there are pre-selected sentences you can use while waiting in the lobby – “Let’s wait for more people” and the like. We didn’t experience any lag and the fact that our first online race was against four Japanese players suggests that the software doesn’t try and find players in your own country before searching further afield. Just an observation, there. It’s evident that Nintendo has listened to the criticisms of fans – Mario Kart 7 feels more balanced than previous Mario Karts and the snaking tricks, which gave players an unfair advantage, have been eradicated. As we said in the opening paragraph this is a game that’ll keep on selling. And that’s something we have no problem with whatsoever – it’s chuffing brilliant. A lot of people must have thought the heavy high street discounts for The Elder Scrolls V: Skyrim were too good to miss – it’s back at #1 in the UK chart this week, pushing Call of Duty: Modern Warfare 3 down to #2. It’s a shame that GAME/GameStation’s £22.49 deal was only for one week. At that price it would have stood a very good chance of being the Christmas number one. It may even do so regardless, thanks to word of its greatness still spreading. This leaves Just Dance 3, FIFA 12 and Assassin’s Creed: Revelations to round off the top 5. At #6 there’s Battlefield 3 and Professor Layton and the Spectre’s Call remains at #7 for the second week running while Uncharted 3: Drake’s Deception is in at #9 up from #16. Mario Kart 7 stays in the top 10 at #10. People must be feeling more active than normal this time of year – both Zumba Fitness and Zumba Fitness 2 are in the top 40, as are both Kinect Sports and Kinect Sports: Season Two. And what’s this at #39? It’s Rayman Origins, which finally makes a top 40 appearance. Better late than never. The PSP has pretty much been ignored by publishers this winter, with just a few annual sport games and LEGO Harry Potter to see it through the bleak winter months. Square-Enix though are coming to the rescue – not only have they almost single-handedly kept the system in the public eye over the past year or so but they’re also giving it one final hurrah. Many of the RPGs that Square-Enix have released on the format are being re-released this week, available for a stupidly cheap £7.99 a pop on the likes of GAME and Play. 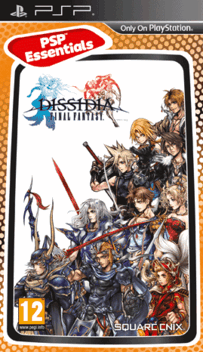 There are six different Final Fantasy games in total along with Tactics Orge, The 3rd Birthday and Lord of Arcana. Namco are also re-releasing Gods Eater: Burst for £7.99. If we could find our PSP we would be having a bit of that. 3DS owners get a second helping of Mario this week too. Mario Kart 7 has though received some mixed reviews, including a 5/10 from Destructoid and 10/10 from Games Radar. We should bare in mind here that EDGE gave Mario Kart: Double Dash on GameCube 5/10 and that went on to find plenty of fans. Nintendo are also releasing Super Pokémon Rumble on 3DS. It’s not a ‘proper’ Pokemon game as the name suggests; our cynical side thinks Nintendo wanted a Pokemon game on the 3DS as soon as possible and thus this mediocre sequel to the WiiWare original has been dished up. GameSpot called it simplistic and repetitive. Don’t be so quick to judge Puss in Boots as a cynical movie tie-in. Reviews have been very positive so far. It’s out on PlayStation 3, Xbox 360, Wii and DS. Power Rangers Samurai also hits Wii and DS. We were (whisper it) curious about the Kinect Power Rangers game but that seems to have vanished off the release schedules. Finally, there’s Now! That’s What I Call Music: Dance and Sing on Wii which boasts of 16 UK #1 hits. It’s being published by Tubby Games, and no, we have no idea who they are either. Next week: Pocoyo Racing (Wii), Just Dance 3 (PS3) and Order Up! (PS3, 3DS).